We’ve just completed another M&IT Agency Challenge event, this time held at The Lensbury in Teddington. This is the fourth Agency Challenge event we have covered for M&IT (Meetings and Incentive Travel) but our remit goes way beyond just producing a short documentary on the event. M&IT are well and truly sold on the value of using video as a team building activity for their delegates and it is often quoted by them as the most memorable and fun part of the event. Team building events and activities come in all shapes and sizes. Some are purely a means of getting people within an organisation together in one place to network, share ideas or simply get to know each other better. However, the more effective ones are those that get groups of people thinking and working towards a common goal or achievement – and often taking part in a challenge which is way outside their usual area of work and expertise. A good team building activity will also challenge their creativity, develop leadership and demonstrate the true benefits of collaborative effort. Using video for team building, where teams are assigned a task to create a short film or sequence as their exercise, has many benefits. First of all it can be a whole load of fun. We find that many delegates relish the opportunity to get in front of, and behind of, the camera and “make movies”. The filmmaking process is, after all, a very collaborative process which involves technical and creative skills in bringing a story together on the screen. It has the potential to serve all types of characters – from those who have a longing to perform and act, to those who enjoy hands-on activities (camerawork, sound recording or lighting) through to those who want to lead the creative process through script writing and directing. We also provide delegates with coaching on the filmmaking process too, so they’ll also come away a little better informed about framing, composition, sound recording and how to tell a story using video. M&IT use video team building very effectively with teams assigned to make a short commercial about one of the presentations made to them during the main body of the event. It is the team’s choice, but it has to be based on one of those subjects. In M&IT’s case these presentations are made by suppliers to the meetings and incentives industry (airlines, hotel groups, national tourist boards etc.) and the delegates are made up of representatives from agencies who are likely to book their services. This results in the delegates paying particular attention to their presentations as they might have to make a short film about them when the video team building part of the day starts. They also combine this with ongoing quizzes throughout the day, again based on the content of the presentations, so by the time the event finishes they are extremely well informed about various suppliers, locations and facilities available to them. This formula can be easily adapted to any business event or conference where you want delegates to come away better informed; for example, when running a sales event at which you are introducing new products or services to your sales force. Pre-warning your delegates of the forthcoming video challenge will guarantee they listen during briefing sessions where the new products and services are introduced. 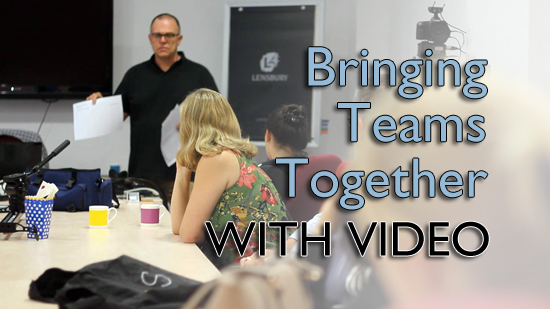 The other benefit of using video for team building is that it can also give a focus to the end of an event, using it to screen the edited films and announce the winning entry. This is generally very entertaining but, more importantly, gives yet another opportunity to share the message. There are also further benefits to using Video Artisan to provide this activity for you. At little additional cost we can also produce a short film about the event. In the case of M&IT the following short documentary is used to promote future events to delegate attendees and sponsoring companies wishing to put on presentations. If you think your next team building event could benefit from incorporating a video production exercise then please get in touch. Whilst this can be extremely beneficial, and lots of fun too, it does require a fair amount of planning and experience in order to get the most out of it. Please call 020 3602 3356 to talk though the possibilities – and see how you can use video to bring your teams together. See the 2016 Agency Challenge here.